The darkness continues its hold on Wonder Woman and Simon Baz. Wanting them to kill everyone there, except for Hunter? Sovereign has come to our time and finds Mera, her daughter, and future Aquaman. We learn that Serenity banished Aquaman from the seas, and that Arthur was forced to salvage his robotic parts off of the deceased Cyborg. Arthur opens a boom tube and says, "Your daughter Sovereign, I'll take you to her." Superman, Flash, Jessica Cruz and Cyborg seem to be trapped in a pocket of a boom tube when they discover a recorded message from Arthur Curry. He came back to kill them, but seeing them all again gave him something he hadn't felt in years, hope. Sovereign is taking the fight to the children of the future. Future Arthur makes his intentions known by attacking Sovereign. Sovereign slams her weapon on the ground and knocks everyone off their feet. It is here we learn that Sovereign came here for one reason, her daughter, as Sovereign is revealed to be Diana's mother Hippolyta. She states, "We will leave this world to die, it does not deserve you". Our heroes arrive just in time for the darkness to envelop them. "Now Go and kill everyone in the whole world". 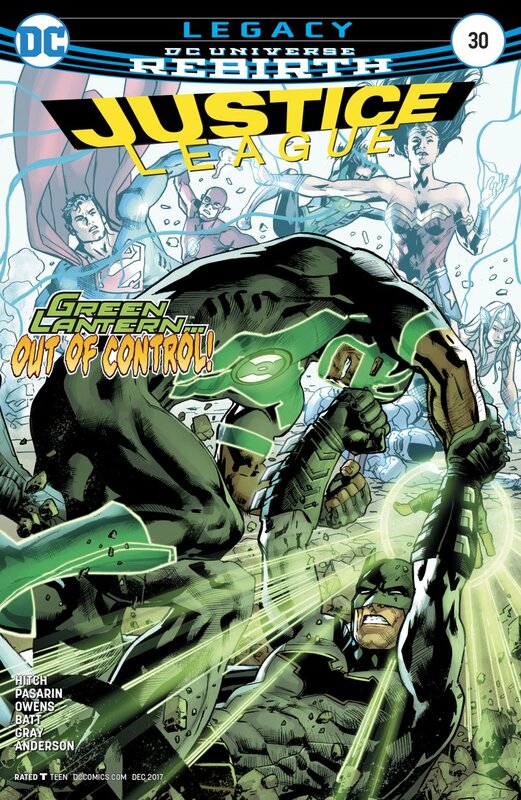 Story - 3: Don't get me wrong, this has probably been Bryan Hitch's best story arc in his 30 issue run. But nothing really seemed to flow well in this issue. We did however learn Sovereign's identity. It was not Diana from the future, yet it was her mother. We also saw the redemption of Arthur Curry, turning on Sovereign in favor of old friends. The one thing I found ironic, as I am sure the two events are not related at all, is over in Action, Jor-El is telling his son the same thing, "The world does not deserve you". Art - 3: Nothing really stands out in this issue, in fact many scenes look rushed. Lack of details in facial features really prohibit this issue from getting a higher grade. Cover Art - 2: Once again, victim of 'what you see on this cover never happens in the book' and for me, takes away from the book over all. Batman is only seen in two pages of the whole book flying in his plane looking for Arthur. Variant Cover Art - 5: Not sure what it is about this cover, but the more I looked at it, the more this was my preferred cover and the one that I ended up buying. 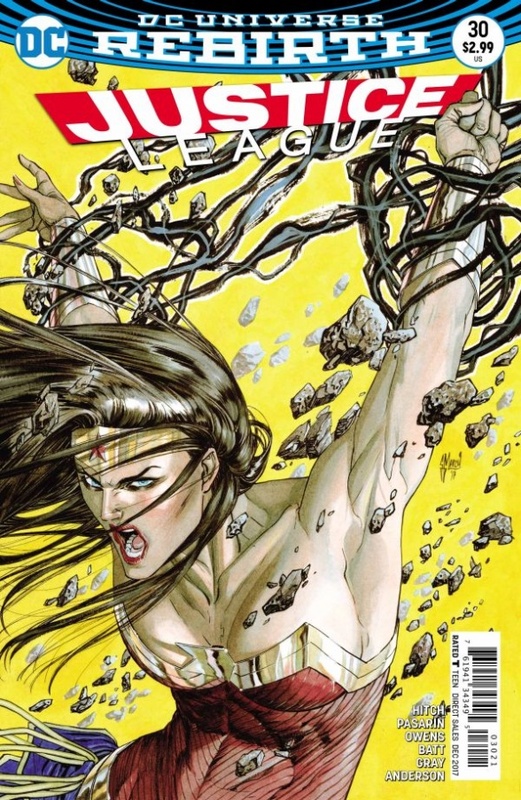 The darkness surrounding Wonder Woman and her facial expression of trying to resist is stunning and is definitely my favorite cover in quite a few issues. If you see this cover out at your local comic shop, give it a look.